A two bedroom upper floor lake view apartment. New carpet and and paint carries the outside in with warming tones and modern furnishings. 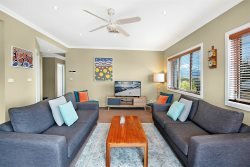 Enjoy the lake and mountain views from your balcony watch the trout swim by or take in the majestic scenery of the Crackenback Mountain Range in this special part of Australia's Snowy Mountains. The apartment is filled with natural light making it feel spacious yet intimate. Bedrooms are comfortable and bathrooms have all the amenities you will require on your get away. The kitchen comes fully equipped for your stay or eat out at the 2 on site restaurants and great local restaurants such as Wild Brumby Distillery or Crackenback Cottage which are both close by. Both Thredbo and Jindabyne are only 15 minutes drive with their many restaurants available. The lounge area has a large screen TV and you can relax on the new sofa lounge and enjoy the view out and over the water. WiFi is provided. As our guest your days can be spent with the many Resort Activities such as mountain bike & canoe rental, archery, indoor pool, paddleboarding [in summer! ], Segways and the renowned onsite Day Spa to be pampered at. The property sits on the Thredbo to Crackenback shared trail which is 17klm trail meandering beside the Thredbo river [summer only access]. You can choose to hike or mountain bike this scenic pathway during the warmer months. This property is a great getaway for the family or a special occasion. Great position in the complex and beautiful view over the lake. Spacious and comfortable living and sleeping spaces and very effective heating. Starting to show its age with the furniture and laundry washer and dryer, but watching wild platypus in the lake under your window makes up for that! Would be happy to stay again. We had marvelous 6 days stay at the apartment. It was a memorable experience for us and the kids. The apartment is in a great location with activities to do and space to explore for the kids. I had even got a chance to do some trail run in the national park along the river. Beautiful! Super convenient to go to Thredbo or Perisher. Will definitely come back for our next winter holiday! Great location. Very convenient next to restaurant. Peter and Joan was so nice to deal with and the communications were prompt and helpful. If you want somewhere to stay in the resort then this is it! Its close to everything and has a great layout. The place was warm and cosy and had everything we needed. Would totally recommend this place. Peter and the team at Snow Escape Holidays Pty Ltd T/As Ray White Jindabyne were lovely to deal with and helped make our holiday easy and enjoyable. Thanks Peter at Ray White. We had a great time. The apartment is in a great location. It was lovely sitting on the balcony overlooking the lake and mountains. Just want to express my sincere thanks and appreciation to Pete for his work throughout this process. Pete provided was very friendly and provided sufficient information prior to checking in.